Ahead of today's sole practice session, the air temperature is 26 degrees C, while the track temperature is 50 degrees. Though it is bright and sunny, as was the case yesterday, there are storms in the area and there is a 20% chance of rain. Overnight it was revealed that Force India has been placed in administration, however, Joint Administrator Geoff Rowley insists: "The team will continue to operate as normal, including racing in Hungary this weekend. "Our aim is for business as usual whilst we assess options to secure the future of the team," he added. Meanwhile, following a pretty uneventful Friday, all eyes will be on Mercedes today, as the Silver Arrows seek to close a 0.7s gap to Sebastian Vettel. Put plain and simple, not for the first time the German outfit is struggling on the ultrasofts, both drivers failing to post a competitive time on the purple-banded rubber as the aborted their runs following poor final sectors. On the other hand, Ferrari and Red Bull are flying. 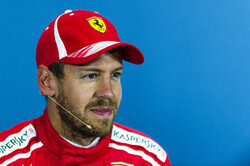 However, that could change this afternoon when Ferrari is able to call on its various engine modes. Certainly, in the wake of Vettel's Hockenheim horror and the passing of Sergio Marchionne the Italian outfit will be seeking a convincing result. With the circuit almost designed with the RB14 in mind, Red Bull will be strong, which is all the more concerning for Mercedes as overtaking is particularly difficult here, and should the Silver Arrows find themselves behind the Ferraris and Bulls tomorrow it could be a long, difficult afternoon. Best of the rest was Romain Grosjean, though with P7 to P15 covered by just 0.851s the midfield fight looks likely to be as manic as ever. The lights go green and Leclerc is first out, followed by Gasly, Magnussen, Vandoorne, Hartley and Alonso. Both Bulls are among the early risers, both on the mediums at a time everyone else is running softs or ultras. Nine minutes in and Raikkonen posts the first time of the day, the Finn crossing the line at 1:17.110. Moments later Sainz posts 18.206. Both are on ultras. Bottas heads out on the ultras as Raikkonen improves to 17.057. Going quickest in the final two sectors, Bottas goes quickest with a 16.986. However, Vettel is on a very strong lap and subsequently posts 16.343, which included a mistake in T13. Hamilton's first flyer sees the Briton go fourth (17.287), 0.944s off Vettel's pace. Interestingly, Raikkonen improved on his second flyer, so it will be interesting to see if Mercedes can do likewise. Hamilton complains of a vibration when he brakes. Gasly goes sixth (19.140) but is demoted when Hulkenberg posts 18.413 slot in behind his Renault teammate. Like his teammate, Vettel looks set to improve on his second lap, however, he aborts in the final sector. Bottas makes a minor improvement (16.793) as does Hamilton (17.244) but both are minimal. "Mate what is he doing? He was straight in the middle." says Grosjean of Ocon. Ricciardo heads out on the ultras, as Grosjean goes eighth ahead of Ocon, Hartley and Perez. Ricciardo almost trips up over Magnussen, who is on the racing line, and as a result can only manage 17.363. Verstappen heads out however he is on the softs. PBs in all three sectors see the Dutchman go sixth (17.578) as Grosjean - also on softs - posts 18.300 to go eighth. In the Ferrari garage, Vettel is in animated conversation with his engineer. Radio replay has Vettel claiming: "Something flew into my cockpit at turn 8, I don't know what it is, I can't reach it." "OK boys, there is something wrong with the engine braking," declares Grosjean, "I get more than I want." Nonetheless, Grosjean improves to seventh on his second lap on the softs (18.084). "OK Max, shall we have another go, but try to keep your pace up slightly." The Dutchman almost trips up over Leclerc, the Sauber driver apologising for his error. However, after the Red Bull appears to brake test him, the youngster changes his tune. "No point brake testing me just because I didn't see him," he says. The cameras cut to the McLaren garage where the floor is being changed on Vandoorne's car. The Belgian has reverted to his old chassis following his problems at Silverstone and Hockenheim. Raikkonen goes quickest in the first two sectors, and despite a mistake in T13 he improves to second (16.455). Now on his qualifying sim, Bottas goes quickest in S2, finally crossing the line at 16.229 to go quickest by 0.114. Meanwhile, teammate Hamilton has spun at T6, the Mercedes taking a rough ride over the kerb. Raikkonen looks set to improve having gone quickest in S1, however he loses time in the second sector and aborts. Vettel goes quickest in S1 and posts a PB in S2, finally crossing the line at 16.170, to go quickest by 0.059s. PBs in S1 and S3 see Raikkonen improve to 16.373. Oh dear, now Bottas has spun at T6, exactly like his teammate just a few moments earlier. However, unlike his teammate he gives the barriers a nudge. On used ultras, Ricciardo posts a PB in S1. Another PB in S3 sees him improve to 17.099 but remain fifth. Told Vettel has improves to 16.17, Hamilton sighs: "I just don't have that grip." Behind the leading six, it's: Grosjean, Sainz, Hulkenberg, Leclerc, Alonso, Gasly and Sirotkin. Despite his various issues, Hamilton improves to 16.749, but remains 0.579s off Vettel's best. Magnussen posts 18.230 to go tenth. Switching to the ultras, Verstappen improves to fifth with a 16.946, but remains 0.776s adrift of Vettel. However, a 16.803 subsequently sees Ricciardo take back the position. "OK guys, I think we've gone the other way now," says... well take a rough guess. A 17.754 sees Sainz improve to seventh, thereby taking 'best of the rest' mantle from Grosjean. "Goddammit, massive traffic into turn six," says Hulkenberg. Gasly has similar issues. "I didn't do a ******* lap without traffic, ****!" Told that Grosjean is five seconds behind, he replies: "Not any more." "This run is very, very weird," reports Grosjean. "I don't understand what's wrong." The session ends. Vettel is quickest, ahead of Bottas, Raikkonen, Hamilton, Ricciardo, Verstappen, Sainz, Hulkenberg, Grosjean and Gasly. Magnussen is eleventh, ahead of Hartley, Leclerc, Alonso, Ocon, Sirotkin, Vandoorne, Ericsson, Perez and Stroll. An interesting session, and one which pretty much confirms what we saw yesterday, though Bottas clearly pulled out all the stops to get to within 0.059s of Vettel. Intriguingly, asked about the engine modes Ferrari and Mercedes have up their sleeves for qualifying, Cyril Abiteboul suggests that Renault has a little something in reserve.